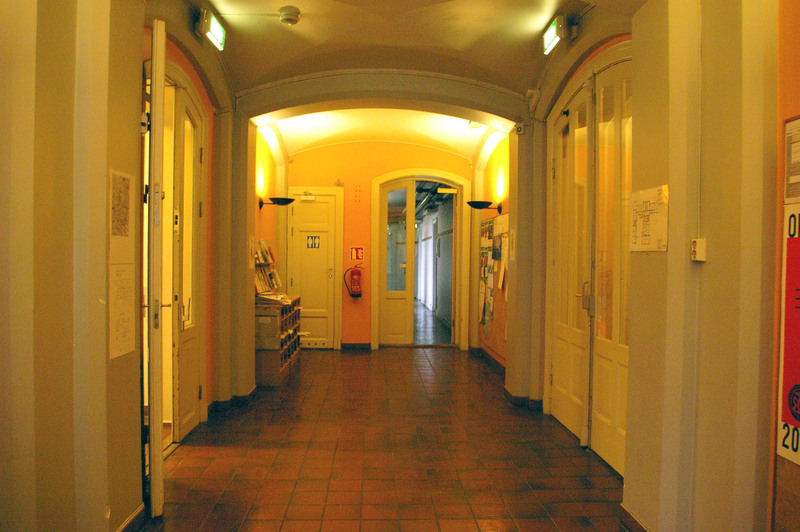 Oslo Art Academy, main entrance. 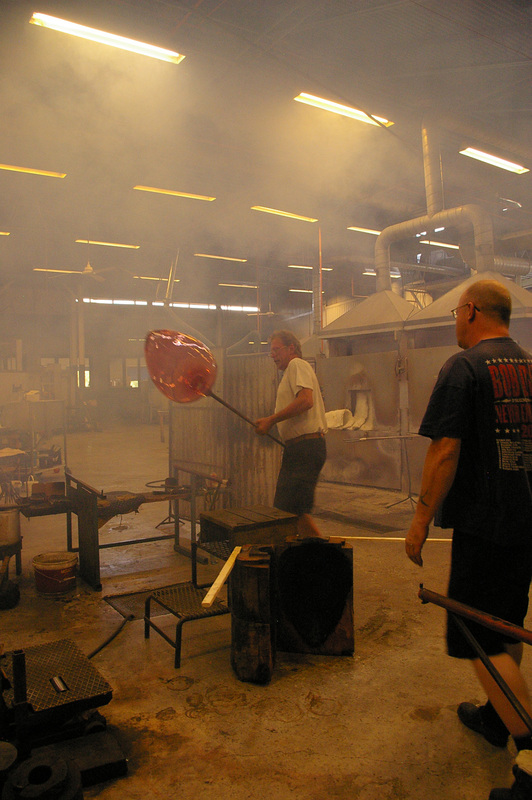 Redecoration, specially designed mouth-blown glass lamps, furniture, speech. 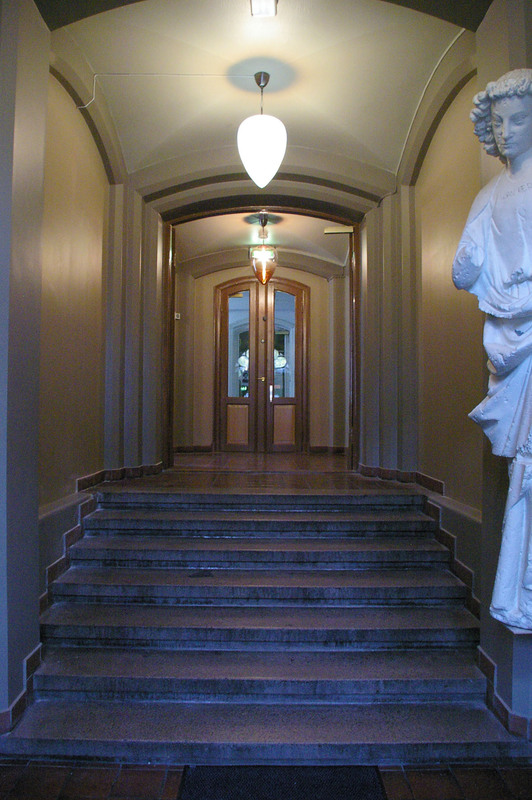 Despite its charismatic character, the Art Academy had no clear main entrance. 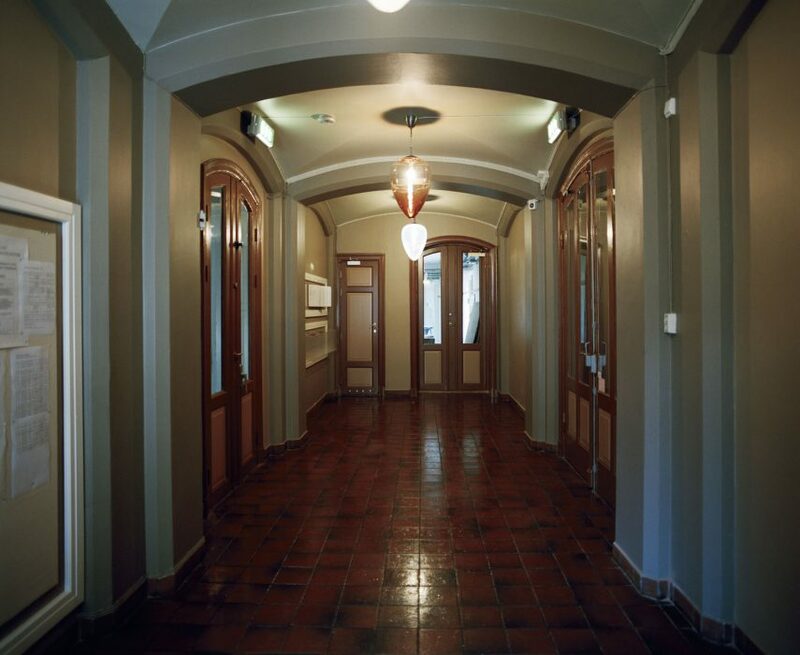 Staff and students used a narrow back entrance, and what was originally intended as the main entrance was messy and mainly used as storage. For visitors the first impression was that of a poorly maintained, closed and introvert institution with no interest in esthetics. 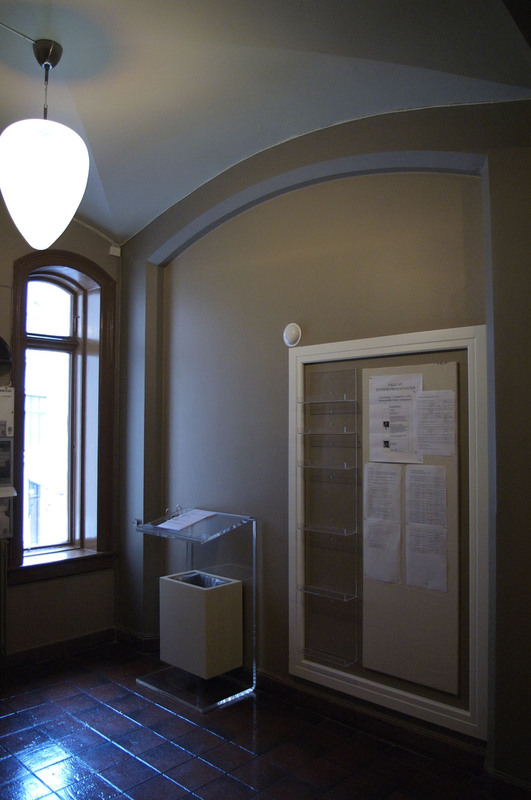 The walls have been brought back to their original colours, and new, functional furniture has been installed. The focal point in the room is a red mouth-blown glass lamp. 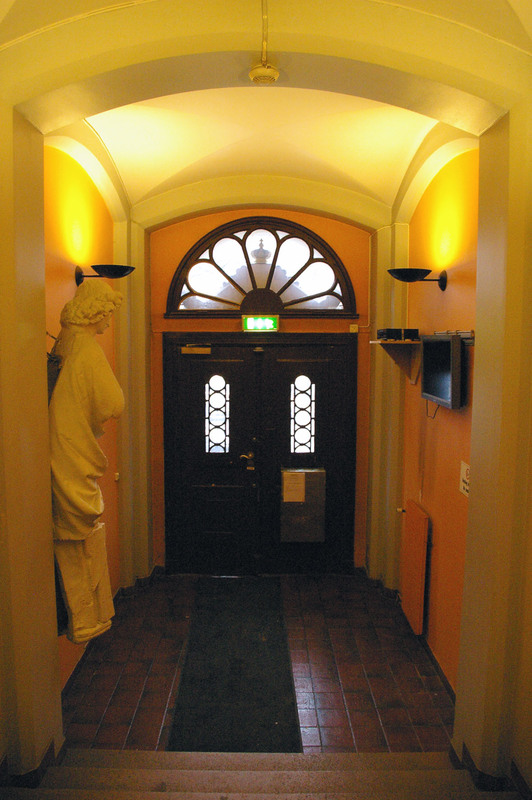 It is based on a story about Queen Maud; shocked by the nation's lack of style, the former English princess installed specially designed red light bulbs in the representational areas of the Royal Palace in Oslo. The ight from these bulbs was flattering to the skin, and made her guests appear younger and healthier. The red light became a subtle frame around her meetings, lifting them out from the surrounding everyday life. 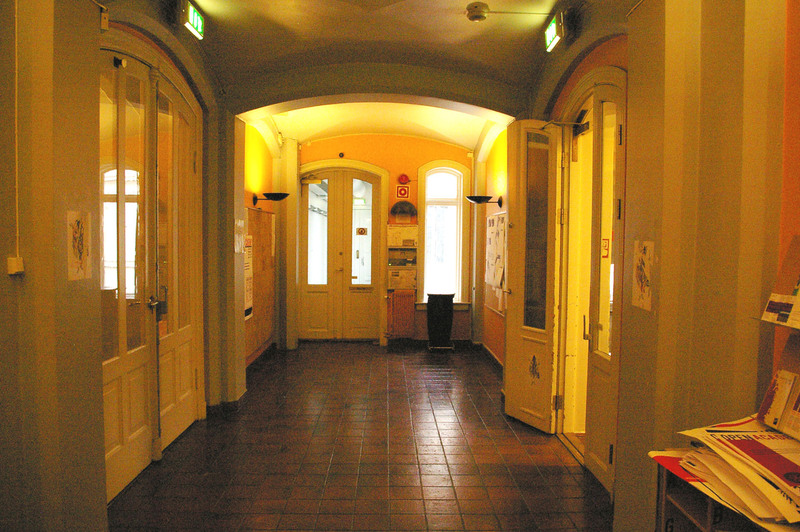 The room was opened at a ceremony for staff and students on October 15th 2008. The red lamp is permanently lit. Til tross for bygningens karismatiske karakter, hadde Kunstakademiet ingen klar hovedinngang. Ansatte og studenter benyttet en smal baktrapp, og det som var ment å være hovedinngangen var uoversiktlig og ble hovedsakelig brukt som lager. For besøkende var førsteinntrykket en dårlig vedlikeholdt, lukket og introvert institusjon uten interesse for estetikk. Veggene er malt opp igjen i sin opprinnelige farge, og nytt, funksjonelt møblement ble installert. Midtpunktet i rommet er en rød munnblåst glasslampe. Den er basert på en historie om Dronning Maud; sjokkert over nasjonens mangel på stil, installerte den tidligere engelske prinsessen spesialdesignede røde lyspærer i representasjonsrommene i Slottet. Lyset fra disse pærene var flatterende for huden, og fikk gjestene hennes til å se yngre og friskere ut. Det røde lyset ble en subtil ramme om disse møtene, og løftet dem ut fra den omkringliggende hverdagen. Rommet ble åpnet med en seremoni for studenter og ansatte15. 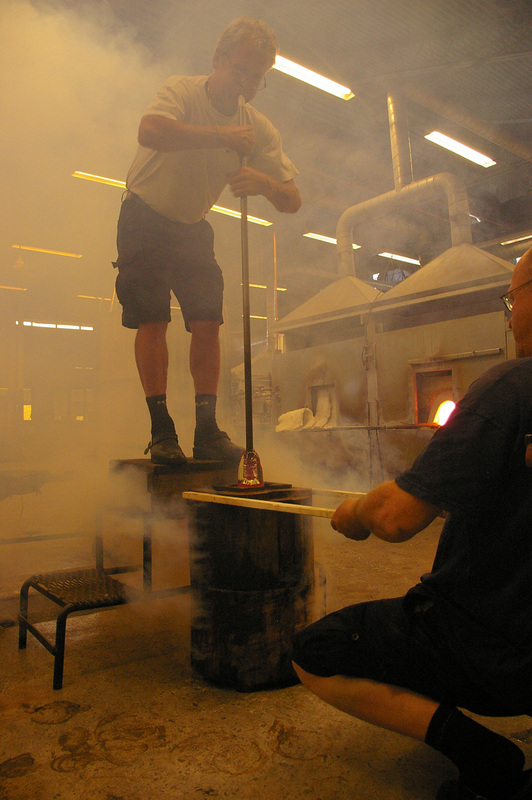 oktober 2008. Den røde lampen er alltid tent.